When Susana Rivera-Mills was 12, her family fled their native El Salvador to travel to the United States for what they thought would be a temporary stay. They were escaping the brutal civil war that tore through El Salvador between 1979 and 1992 — a war that had brought violence to the streets and left Rivera-Mills uncertain whether she would see her mother again each day when she was dropped off at school. The fighting continued long beyond the six months, and the family had had no choice but to start a new life in the U.S. None of the family members could speak English, and they had left El Salvador with only a suitcase each. It was a shock for Rivera-Mills to be one of only a few Latino students in the small California town they moved to. The experience of dislocation as an immigrant in the U.S. would eventually prompt Rivera-Mills to create a professional life that would allow her to help others in the same situation. Her experiences, Rivera-Mills says, created in her a desire to support those who lack a place to belong. 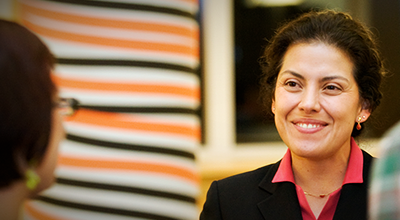 As associate dean for Oregon State University’s College of Liberal Arts and interim director of the university’s new Center for Latin@ Studies and Engagement, she’s turned her difficult experiences into inspiration to give back to her community. Driven to pursue education by her family’s struggles, Rivera-Mills shaped her career to support immigrant populations. With a doctoral degree in romance linguistics, she has been an advocate for the preservation of Spanish among Latino communities in the United States. With CL@SE, Rivera-Mills plans to expand Latino research by engaging multiple communities in studying Latino issues. The center’s mission is to promote research and outreach to advance knowledge and understanding of Latino contributions and issues surrounding the Latino population in the United States. But before Rivera-Mills could find the power to help her family or see herself as a role model within her community, she had to learn how to survive in a completely unfamiliar situation. Both of Rivera-Mills’ parents had to work 12-hour days just to keep the family afloat. Suddenly stripped of the stay-at-home parent they’d enjoyed throughout their lives, she and her siblings had to take responsibility for themselves; waking up, getting ready for school, making it to the bus, completing their homework and making dinner on their own. That responsibility, coupled with a desire to ease her parents’ struggles in any way she could, led Rivera Mills to take a full time summer job at a plant nursery, though she was only 12 years old. “In my child mind, that was to me a way where, if I could work and buy my school clothes, or work and take care of certain things, then that was my contribution to try to calm what I perceived to be chaos around me,” she says. The same spirit that inspired Rivera Mills to try to make things easier for her parents — working to provide her own money as well as keeping incidents of kids bullying her at school to herself — eventually helped her aspire to higher education. Rivera-Mills earned her doctoral degree in romance linguistics from the University of New Mexico in 1998. After completing her degree while working full-time to stay out of debt, Rivera-Mills had achieved her goal. When she began her first professional job training future secondary language schoolteachers at Northern Arizona University, she felt she finally had secured the resources to help her parents. And she was right — with help from Rivera-Mills and her brother, who had recently graduated college, her parents were able to retire after relocating to Klamath Falls. “It isn’t about the money so much as it’s about the honor, respect and gratitude being returned to the previous generation,” Rivera-Mills says. But Rivera-Mills didn’t stop there. After achieving the goal of helping her family, she began to understand the implications of her role as a Latina woman with a doctoral degree. Embracing that newfound responsibility, Rivera-Mills committed to giving back to her community and to students in her position. She supported the National Hispanic Scholarship that helped her get through graduate school, and mentored Latino students who were experiencing the same displacement and loss of identity she went through. Now, Rivera-Mills gives talks around the state to encourage students to pursue higher education, and has worked through programs like Oregon State’s Adelante Leadership Program to endow Latino students with the belief that they can be leaders in their communities, in the state and beyond. When she shares her story with students, Rivera-Mills says, she sees how powerful it is for them to identify with someone who has achieved goals similar to their own. “That has become a huge drive that continually feeds me and my passion for the work that I do,” she says. She’s continuing that mission with CL@SE, which began its inaugural week Oct. 8. The theme of seeking common ground has become a motto for the center that Rivera-Mills believes reflects its goals to engage people from different backgrounds and perspectives to find commonality in Latino issues that also impact the United States as a society. “We’re hoping in promoting this common ground we will be approaching diversity from a perspective of unity and not one strictly of difference,” she says. Rivera-Mills says the center is already working to create new partnerships by connecting with community colleges around the state to bring the Adelante Leadership Program to students throughout Oregon. Her goals for the center include growth and encouraging more Latinos to seek leadership positions, but Rivera-Mills says her first priority remains creating a place of belonging for young students going through the displacement she experienced herself. Exhibit will be on display Oct. 8-31. All CL@SE events are open to the public. For more information about the center, contact Rivera-Mills at susana.rivera-mills@oregonstate.edu or visit the center’s office in Room 233E Strand Agricultural Hall. Posted in OSU People and Programs. © 2019 OSU Spotlight, all rights reserved. The Spotlight blog is maintained by the Office of Web Communications.